In the top left corner navigate to View > Window Layouts > Default Layout. 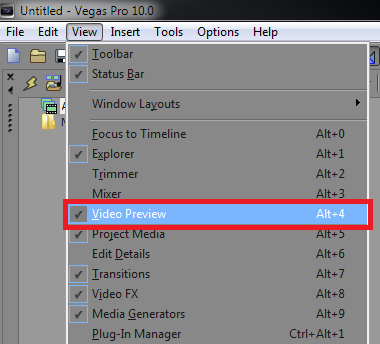 You can also use the shortcut Alt + D.
You can also show and hide separate windows in Sony Vegas Pro 10 by checking or unchecking items within the “View” list. For example, hiding the Video Preview window would remove it from the layout. Yes, I have a question. How do I resize my import media section as it ha suddenly grown big? I dunno how to change this back to normal, but it’s annoying. Please help? My Sony Vegas stopped auto snapping you know when you bring to separate videos together the yellow/blue line pops up and they like “snap” together I don’t know how to fix it… can anyone help? Hi there, I also have a problem . My FX Effects windows got stuck and i don’t know how to move it. I tried everything and nothing works ! :(( Could you help me? Thank You! i have a problem and idk how to view this comment later im not sure if it will pop up telling me some one replied. but my problem is i used to have the color corection tab along with alot of little options in my video fx but now mostly all of them are gone HELP! How to bring up sony vegas crop window. The window to preview the crop that has the big transparent F on it is gone. Disappeared. I already reset the defaults. I see the controls for position and rotation, but not the preview window . the one with the big F. In Sony Vegas. My media generator is inop. I cant get the clouds to animate even when I use keyframing. Please help. The AVI Videos Works on Sony Vegas pro 10? i have a problem with my vegas pro 11!!!! pleaaaase help!!!!!! I had the same problem, Mattia. The Event FX window is still there; you have accidentally hidden it and need to restore it manually, as not even un- & reinstalling the software will work. Look for the lines of six dots, under the X:s. Hold and pull them out, like drawer handles. One of those is the window you are looking for. You will find it. Hopefully, you still have time to finish your project. If not, maybe this post will help someone else. thanks man !!! it works !!! Aqulll, can you help me with this problem? Me too, I also have this problem too! Don’t know why, PLEASE HELP!!! My Video event pan/crop window is dockd/hidden sumwer… any way to get it back again??? Thank you sir your epic glitch tutorial helped me a lot…as you said in the video that send me some video response so that i could see your video…help me anyone i dont know how to send video response…i forgot…anyways i got a new idea to make my new intro…and “AQUUL” pls can i also make a tutorial on my channel…using your backround or audio?i will write in the video description that the audio is by aquul…blabla…and here is the original epic glith tuto…- (link) pls can i make? When starting Sony Vegas, try and hold CTRL + SHIFT, you should get a little dialogue box up. Click Yes, and it will reset your Sony Vegas settings. Aquul, please help me with the video preview window, I cannot see the video FX im putting on a certain slide, only I can see the FX when I render the video. How do I reset the little windows that pop-up? Like I went to move my Text Media Generator Pop-Up window and it went into another window and I can’t move it anymore? Any help? On the left hand side corner you will see a 6 dotted button, it is under the (x). Click on it and slide it down and the window will pop out. Thanks to this guy I know somewhat of sony vegas pro 11. Thank You. & Please check my videos on youtube, since Im the beginner I will need help with the intros and etc. When i render there is no sound???? please help!!! hey, when i make a new project and insert media into the video track it uses all previous media track settings like if i split a bit of media then every ting i import onto a media track is split in the same way can u help reset this? Hi Aquul, I have a question to ask. In your video”Photoshop CS5: Ellipse Logo Making / Creating – Tutorial”, your background is what you could send me back without the logo please? quiero aprender a manejar este programa …de verdad lo necesito con urgencia. algien que pueda traducirlo y ayudarme se lo agrdeceria … bye gracias. hi i have a problem when i render a video it till me Invalid Device was specified and it stops what should i do ?? With a green screen background, when I use the Circle in Cookie Cutter, I see a green rectangle in the middle of the black cutout! If I use the Chroma keyer to remove the green background, everything goes black, except for this green rectangle! Did you ever get this figured out? I have the same problem where when I use the cookie cutter, no matter how much I cut away there is always a rectangle that will never go away in the center. how to put the layout vid thing into sony v pro 10? Boa tarde meu caro amigo. queri saber como faço pra aplicar esses templates no vegas, achei muito legal mais não sei usar, poderia por gentileza me ensinar, me mostrando um tutorial. Ficaria muito grato e parabéns pelo site e muito interessante. Thank you wery mmutch i didn’t know this i was just about reinstalling my sonyvegas. it’s intresting how i got here btw? hey aquul, can you help me?can you give me a software of sony vegas 10?if its ok?where can i download it?do you have a link to it?thanks!my previous sony vegas is a trial version. Hello friend to change the letters in your template to other text introduction by me as I can configures the sony vegas so it does not so much because my computer even though I work, or rather how I can configure my way but that does not change the effects and sounds …? can u help me make a cool intro like the intro: Sony Vegas Pro 10 and 9 Intro Template: Elements Intro/Promo/Trail on youtube. Can you please make a tutorial on how to make a website with werdpress?? will be helpful…. There are plenty of resources on Youtube to learn how to make a wordpress website….there are even books that have step by step instructions. Dang, I knew that one already. Oh well. I created a couple of different layout based upon what type of editing I’m doing (i.e. music CD, Video, YouTube,etc) and save them to quickly switch between them. Be careful, some things are NOT reset by doing back to the Default setting. That’s a great idea Chad, I might create another tutorial showing people how to do that. Thanks for the reply. heey AquuL wich software do you use for ur web design?? pls help me there is nothing that i can find. windows 7 is that of my father. but i want a new pc. aquul im haveing trouble editing the text in sony vegas pro 10. would you please help?!? How do i edit the text from your templates?